Last year was another sweet year for live acts. 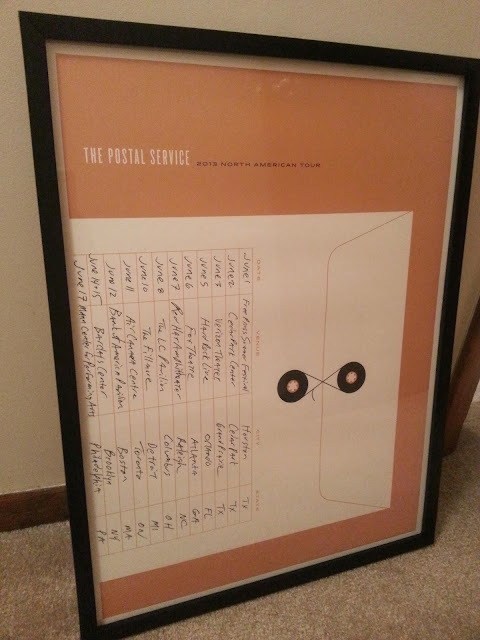 This week's poster is from The Postal Service's 10 year anniversary tour of their album Give Up. The Postal Service was everywhere last year and I actually got to see them twice. Once in Columbus, the other at Lollapalooza where they played the same as Mumford and Sons. My buddies and I opted to watch The Postal Service over Mumford and we got fairly close to the amazing performance. We then tried to see them the Sunday night of Lolla at the Metro. We waited outside trying to get tickets for 2 hours. We eventually gave up 30 minutes after the show started. It pains me to say this was their last show together...until 10 years from now that is. This particular night was great in Columbus. My wife and I drove down on Saturday after I bought tickets about 2 hours before the show on Stubhub. We got there are were blown away at how good they were live. Ben Gibbard and Jenny Lewis worked off of each other on hits such as Such Great Heights and The District Sleeps Tonight. They had the crowd singing along to every word of every song. It was like a flashback in time to my college years and to the truly good times in my early 20s. They continued along through the night and that is when they sent me into a trance with Nothing Better. They had several tour posters last year. They had three variations of color of this poster, orange, pink and powder blue based on portions of the tour all by Jason Munn. 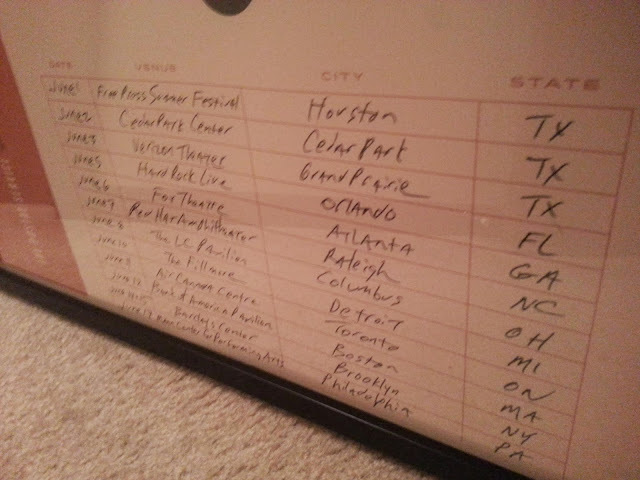 They then had unique posters for their European tour and 4 individual shows, one of those being the forever regretful Metro show. Lets hope they'll come back down the road maybe 5 or 10 years from now so I can have another shot of catching their that last show again.